National Weather Service (NWS) to determine if a Red Flag Warning is in effect. It is critical you verify the current Fire Danger Rating, Red Flag Warning status and local burn ban/restrictions BEFORE burning and participating in outdoor activities. Please contact your local fire department or emergency management office for the most current information regarding restrictions in your area. This map may not be all-inclusive. Click on the county/tribal area to view additional information regarding burn bans/restrictions for a particular area. Please contact your local fire department or emergency management office for the most current information regarding restrictions in your area. Areas shaded in gray have current burn bans/restrictions in effect. 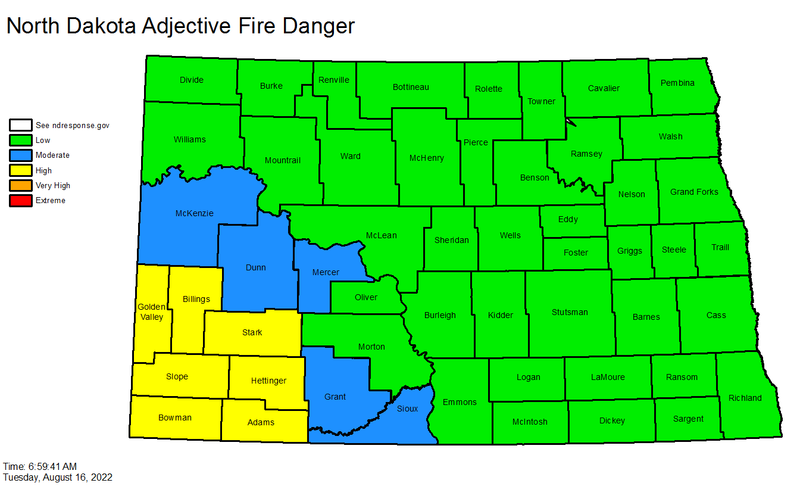 The ND Fire Danger Map is issued each morning. Although not very often, there are times when weather conditions that develop during the day result in a change to fire conditions and lead to the issuance of a Red Flag Warning. Please contact your local fire department or emergency management office for the most current information regarding restrictions in your area. If the map is blank, there are no current red flag warnings.